The diatom species responsible for thick blooms in mountain streams and ponds – colloquially known as 'didymo' or 'rock snot' – can coat moist surfaces and promote bacteria by secreting a slimy substance, known as mucilage, that supports all types of growth. Read about researchers' efforts to uncover the origins of these common algae. Maybe you've heard the old joke: What's the worst thing you can do to a boat? Put it in water. 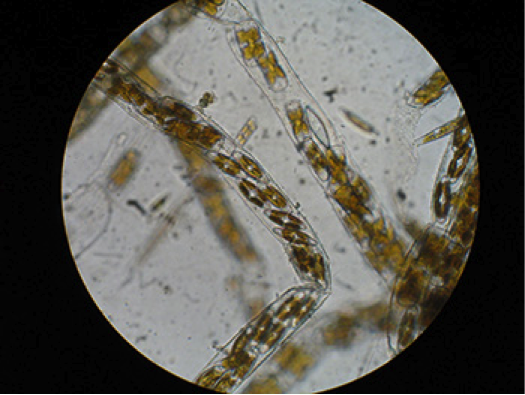 Once a boat enters the water, microorganisms begin accumulating on its surfaces, creating a big mess and a considerable amount of drag. The drag created by microorganisms-in particular, single-celled, silica-shelled organisms called diatoms-results in significant fuel loss on large container ships each year. Light micrograph of live Cyclophora tenuis cells. These marine diatoms form colonies held together by mucilage pads produced at the ends of each cell. Colonies are typically anchored to rocks or macroalgae by these mucilage pads. Image courtesy Matt Ashworth. Diatoms are one of the most common types of phytoplankton and a major group of algae. They constitute a large percentage of all living matter in oceans, rivers, and lakes. One species, Didymosphenia geminate - commonly known as didymo or rock snot- is responsible for thick blooms in mountain streams and ponds. A menace to hospitals, the species can coat moist surfaces and promote bacteria by secreting mucilage that supports all types of growth. For researchers in Edward Theriot's lab at The University of Texas at Austin, US, diatoms (and their snot) are rich objects of biological research. "There are hundreds of thousands of species in the world, in every body of water you can think of," said Matt Ashworth, a researcher in the lab. "They're a very successful young group, and we're interested in understanding how they've evolved and colonized different ecosystems." For decades, diatoms resisted study. Their genome is notoriously difficult to analyze. Morphological studies, based on the shape of a species' shell or other features, often contradict the results of molecular testing. However, next-generation sequencing methods - in combination with computational techniques and powerful supercomputers - are helping researchers better understand the biology, evolution, and dispersal of the diatom. Light micrograph of a colony of Berkeleya rutilans diatoms. In this image, we can see the diatoms within the mucilaginous tubes secreted by the cells in the colony. Though the diatoms are microscopic, the tubes can be seen with the naked eye. Image courtesy Matt Ashworth. Using these new tools, researchers are trying to answer a number of basic questions about diatom evolution: What were the earliest diatoms like? How has the organism moved from a single site to every body of water in the world? And, how have some species developed the ability to produce remarkable amounts of snot? "There's this idea that the early diatom was a small flagellate, but what we're finding at the base of the diatom tree are things that are long and tubular, much like the tube inside of a paper towel roll," says Edward Theriot, director of the Texas Natural Science Center. "In the diatom world, this is a radical view, but it's exactly what the tree is telling us." The researchers analyzed ribosomal and chloroplast genes of more than 200 diatoms and Bolidomonas (a closely related genus). They wanted to test the prevailing understanding of where certain diatoms fall on the evolutionary tree. Analysis included species used as models in genomic studies, and diatoms whose placement in the diatom phylogeny has been problematic or controversial. After generating massive amounts of data using next-generation gene sequencers, the team used the Ranger supercomputer at the Texas Advanced Computing Center (TACC) to align, organize, and analyze the DNA data, and to run phylogenetic programs that sketched out the evolution of diatoms as a whole. (TACC recently decommissioned Ranger and replaced it with Stampede). "There are a number of programs that compare DNA sequences and estimate how those DNA sequences evolved from each other. Some have very complex algorithms," notes Ashworth. "Before we had access to Ranger it would take weeks and months to run. Ranger does the same analyses in hours. It's been a very powerful tool to give us quick ideas about how different strains are related to each other." Light micrograph of a live Striatella unipunctata cell. This marine diatom uses a mucilaginous stalk (lower right in image) to anchor to substrates such as rocks, piers, or boat hulls. Image courtesy Matt Ashworth. Ranger not only arrives at an answer faster, but also lets the researchers test alternative hypotheses. "Sometimes, the best tree from molecular data looks radically different from what morphology tells us to expect," Theriot explains. "With Ranger, we can redirect from just finding the best tree for a dataset, toward asking how different that best tree is from what scholars thought about diatom evolution, say, 100 years ago." For some of the lab's more focused studies on the evolution of the rock snot's mucus-producing capability, the researchers sequenced the transcriptomes (the messenger RNA molecules expressed from an organism's genes) of a half dozen species to identify the key genes for the molecular production of the mucilage. "People have been trying to characterize that mucilage chemically for 20 years and haven't come up with much information," Ashworth says. "Taking a transcriptome approach, I can generate a lot of data very quickly and tackle the issue not at the end results-which is the sugar that is secreted-but at the very beginning; at the point of the molecular machinery that assembled and allowed for the secretion of that sugar in the first place." To read Aaron Dubrow's complete article, visit the Texas Advanced Computing Center's website.